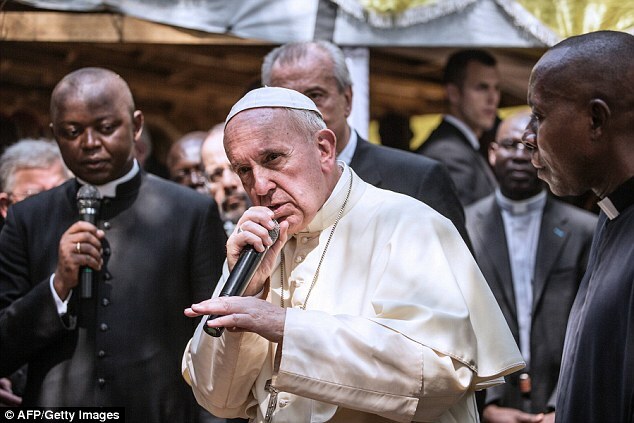 Standing slightly stooped with a microphone to his mouth and hand held horizontally, Pope Francis has inspired a wave of hilarious rap lyrics with this perfect 'rap star pose'. 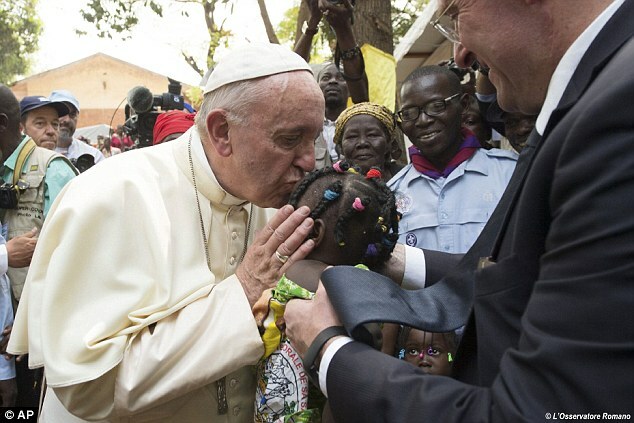 The Pope was pictured in the classic hip hop artist's performing pose while speaking during his tour of the Central African Republic yesterday. With a serious look on his face and his back slightly bent - caused, in fact, by his sciatica - the well timed photograph caught him when his hand was raised as though he was counting beats. 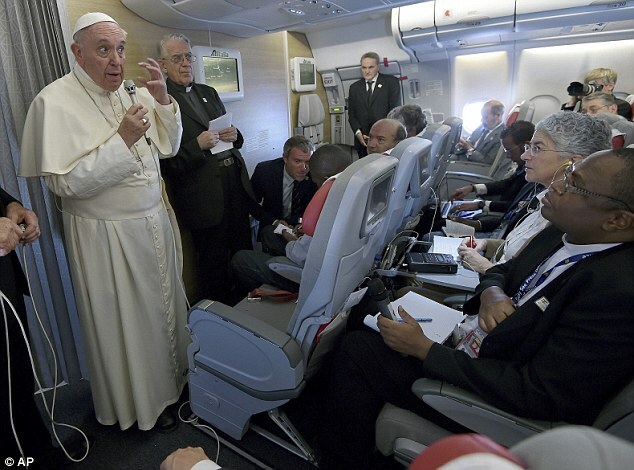 And soon after the photograph was published, Twitter was awash with waves of potential Pope rap lyrics. Under the hashtag #PopeBars, hundreds of users wrote out four-bar verses with a hilariously religious theme. Among them were plays on some of the more famous songs performed by modern rap artists. Mirroring the opening verse of House of Pain's song Jump around, one person wrote: 'Pack it up, pack it in, let me begin, I came to win souls, that's not a sin. Another, copying the Notorious B.I.G. song It Was All A Dream, posted: 'It was all a dream, I used to read Luke 4.17. However, what many didn't realise was that Pope Francis often adopts the slightly bent pose due to his sciatica - the illness which causes him back pain. On a much more serious note, yesterday Pope Francis also claimed humanity is effectively committing 'suicide' if this week's UN climate change conference fails to curb carbon emissions, Pope Francis has warned. In a foreboding statement, the Pope yesterday claimed the conference is most likely humanity's last chance to thwart global environmental disaster - and warned the world was 'at the limits of suicide'. His comments were made in an hour-long news conference aboard the plane returning him to Rome at the end of a six-day trip to Africa. 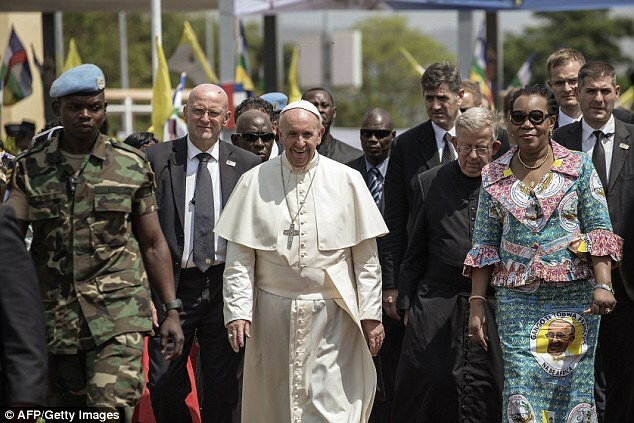 Francis, who visited Kenya, Uganda and the Central African Republic, also said the continent was 'a martyr of exploitation' by wealthy countries who lust after its natural resources and try to impose Western values instead of concentrating on development. 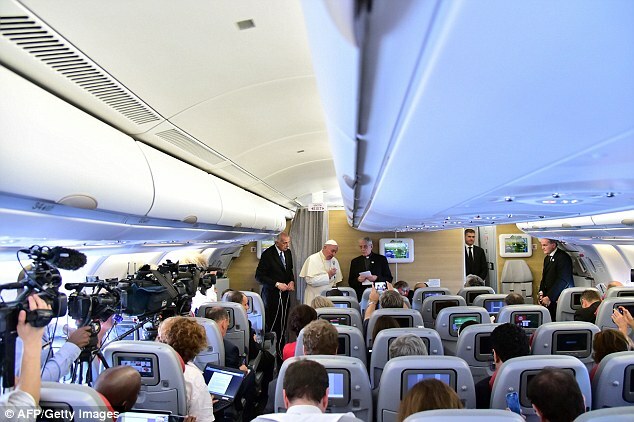 The Pope was asked if the UN climate summit in Paris would mark a turnaround in the fight against global warming. 'I am sure that the [Paris delegates] have goodwill to do something. I hope it turns out this way and I am praying that it will,' he said. World leaders launched an ambitious attempt yesterday to hold back the earth's rising temperatures, with the United States and China - the world's biggest carbon emitters - urging the summit to mark a decisive turn in the fight against global warming. 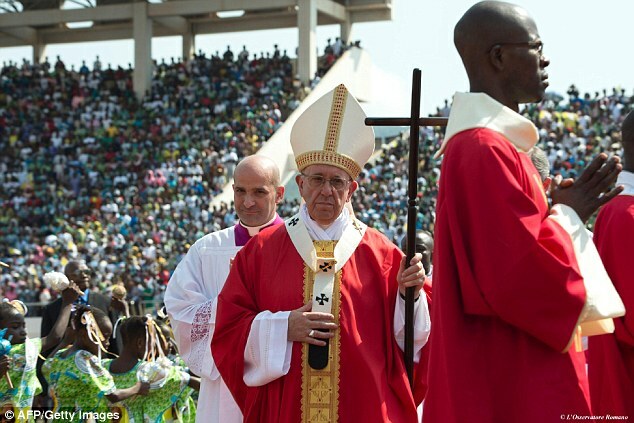 The Pope's last stop in Africa was the Central African Republic, one of the continent's poorest nations. He made an unscheduled stop at the country's only paediatric hospital, where doctors told him that they did not have oxygen and that most of the children there were destined to die of malnutrition or malaria. 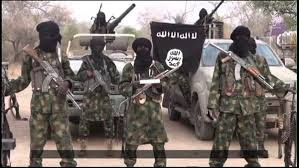 'Africa is a victim,' he said. 'Africa has always been exploited by other powers ... there are some countries that want only the great resources of Africa. 'But they don't think about developing the countries, about creating jobs. Africa is martyr, a martyr of the exploitation of history,' he said. He sidestepped a question about the Church's ban on the use of condoms to stop the spread of HIV-AIDS, saying it was reductive to talk about condoms while African countries were mired in poverty, social injustice, wars and human trafficking. He also confirmed that next year he planned to visit Mexico and hoped to be able to visit Armenia. 'But I am old and these trips are heavy,' he added.